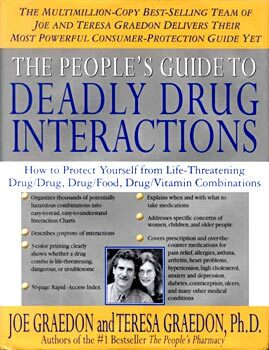 Includes vital information on Lanoxin, Vasotec, Cardizem, Naprosyn, Prozac, Mevacor, Seldane, Ortho-Novum 777, Capoten, Tagamet, Coumadin, Lopressor, Calan, Micronase, Dilantin, Cipro, Voltaren, and scores of other commonly prescribed medicines. "At last, someone has tackled this most complex and critical area. Only the Graedons could make this clear and understandable. A 'must have' for anyone interested in their health." "Every health-conscious consumer should have a copy of this at arm's reach." "A consumer-friendly, accurate, and useful resource for professionals as well as patients." "An essential resource for every home medical library. Sure to become a classic."